Surfland Bait and Tackle – Plum Island Fishing » July 19, Beach finally produces, Flats on and off. July 19, Beach finally produces, Flats on and off. The weekend finally brought some relief for the beach fishermen. The stripers were cruising the shallows out front and were pretty active. It was better at night, but the daylight hours worked too. Some of the guys and gals with a spread of rods along parking lot 1 in the reserve were reporting that one rod would go off, bring it in, and another would start to go too. There were plenty of small fish, but big ones too. We weighed in a 33 pounder and a few 20’s from the beach. Joppa Flats was on Friday, off Saturday, and on again Sunday. Friday saw one local grabbing 30 fish, almost all shorts, on the tube and worm. Six to 7 fish for another, and a few keepers along the way. Saturday, however, the fish just would not bite. I had calls from two very frustrated anglers. Then Sunday morning the fish got active again, and even the rookies came home with some fillets for the grill. Here are some pics of kids getting the Striper fever. 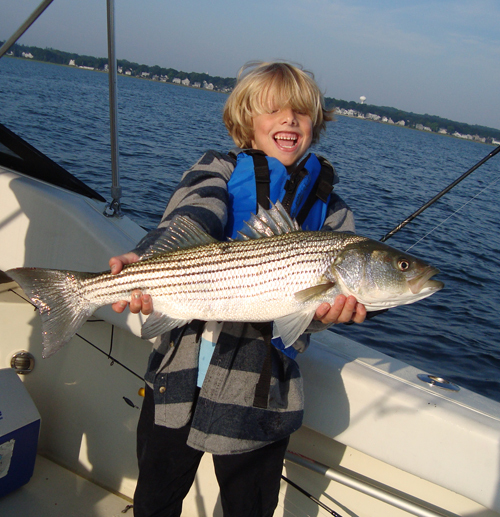 Picture number one is of Charlie with his first striper on his dad’s new boat, and also the first striper of the season for him. 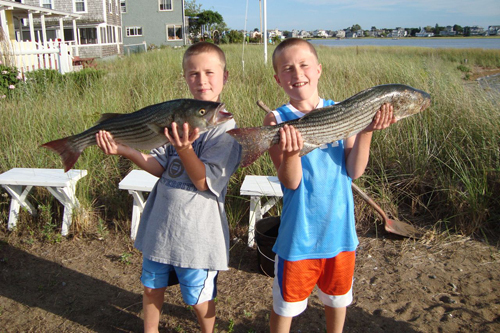 Second picture is of twins Ben and Max with their first stripers ever. Two 30 inch keepers. They also grabbed a few smaller fish all the way down to 18″. I’m planning on making my first trip to Plum Island this Friday and was going to fish from the beach (don’t worry folks, I’ve been doing all my striper fishing in Rockport thus far). Does anybody have any recommendations? Would like to catch some stripers, but will settle for flounder and skates if need be. Thanks for the info. GREAT JOB ON ALL THE FISH KIDS!! FISHED THE JETTY YESTERDAY (WED). UGGGGGGGGGG 3 FISH.. MAYBE BP WILL REFUND MY GAS MONEY FOR THE DRIVE DOWN THERE.